On the top right is – or was – a little button that acts as a mouse. Neat idea, but seemingly not fit-for-purpose. 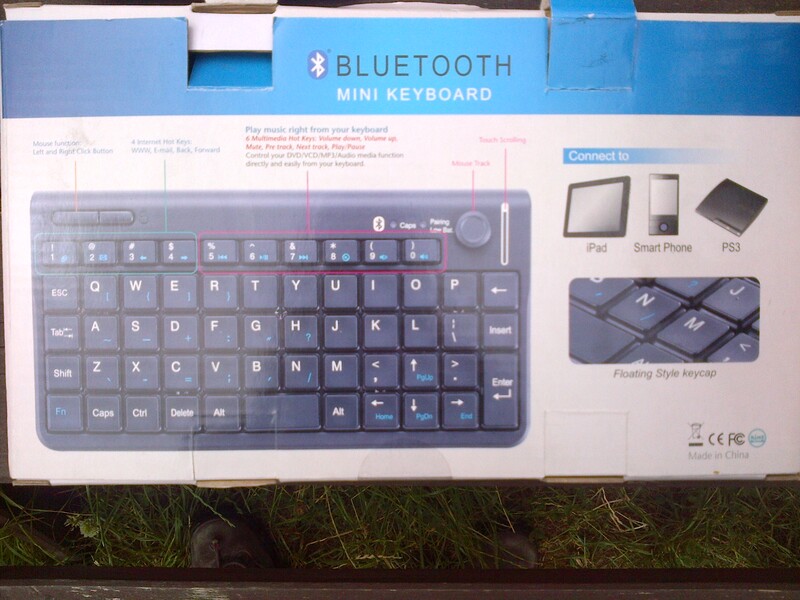 When I extracted the keyboard from my bag, I discovered that had broken off. I retrieved the remnants of the mouse from the bag and presented them yesterday morning to the owner of Sussex Computer Centre. I do not think that any shop owner relishes a customer trying to return items that either do not work or are damaged. 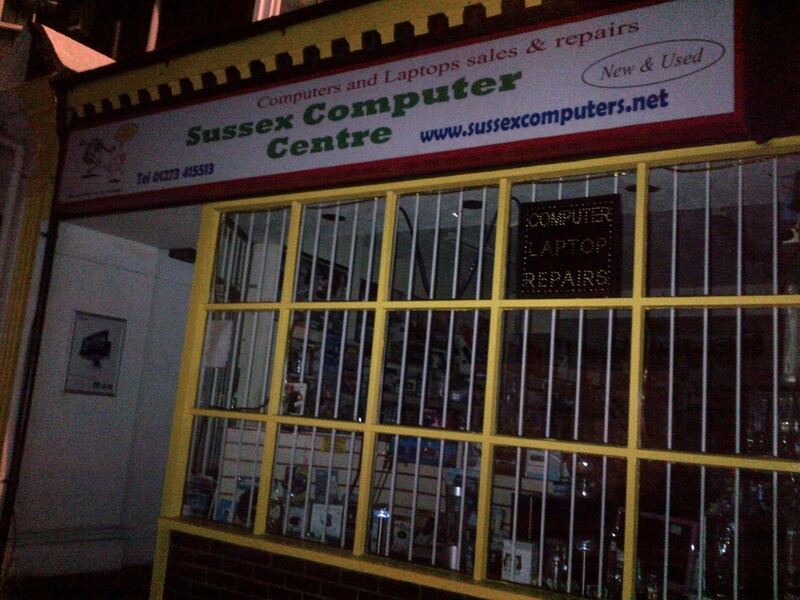 But bearing in mind this business has been running for over ten years, I would have thought the owner might have developed some customer service skills in preparation. Seemingly not. Essentially, it was my fault. Indeed, he asked me whether I had dropped it. Or put another way, I dropped it and therefore it is a ‘customer problem’. The fact that he may have sold me something that is not actually fit-for-purpose does not come into it. He will not be selling me anything in future. Latitude is a music, comedy and arts festival held over three days in parkland in rural Suffolk, England. There are a number of stages located very much in earshot of one another generating a cacophony of sound. The main stage is called The Obelisk Arena. The stage is flanked by two large screens; a further one sits behind the production platform. On Saturday night, the Obelisk Arena was stunned by Kraftwerk. 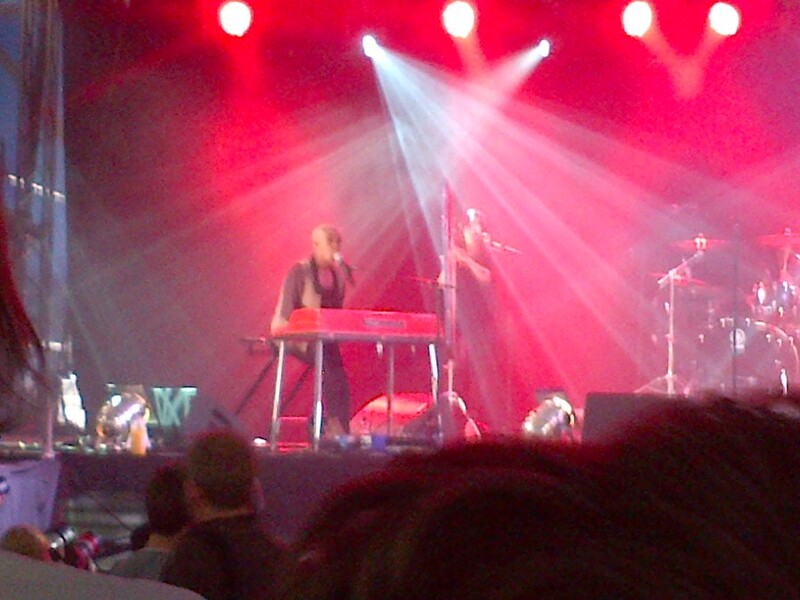 Tracy Thorn, formally of Everything but the Girl, appearing in the Literature tent, described Kraftwerk to author and DJ Stuart Maconie as “four old blokes with laptops”. In a literal sense she is correct. But she misses the point. The pioneers of electronic music pioneer on; whist the music is unchanged – partly because of its timelessness – its presentation is awe inspiring. The Robots – a fabulous track in its own right – is accompanied by four pixelated erstwhile ‘Man Machine’ Kraftwerkers rotating in front of the current incarnation (only Ralph Hütter of the original line-up remains). By contrast, ‘The Model’ and ‘Tour de France’ played to archive footage of models and racing cyclists respectively. Trans-Europe Express featured a geometric train. And then Autobahn played to imagery of an idealised Autobahn hosting iconic German vehicles, VW Beetles, campers and classic Mercedes from an unspecifiable period in the past. For the time being, this is unmatchable music presentation. 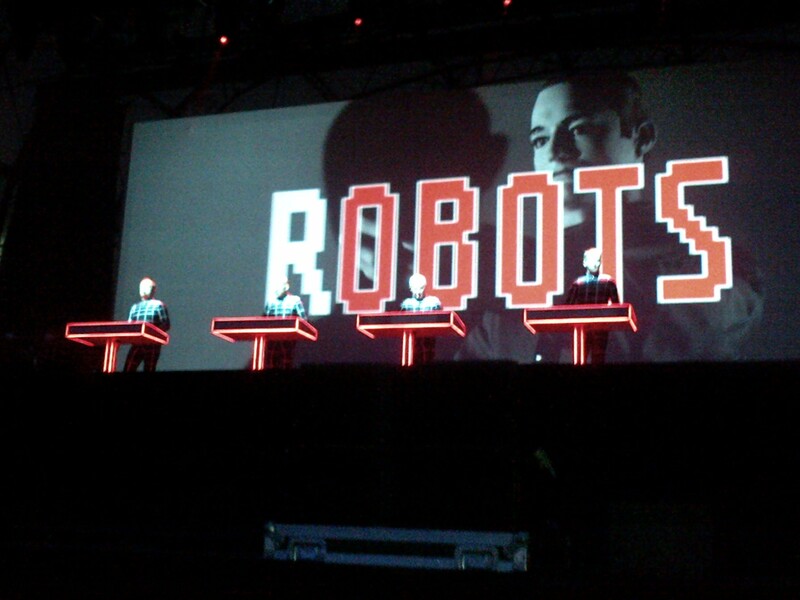 Many of the bands performing this year owe much to Kraftwerk. So much so, in the case of Hot Chip who preceded Kraftwerk in the Obelisk Arena, that singer Alex Taylor adorned his Kraftwerk Autobahn t-shirt for their performance. And what a belter it was. Largely featuring tracks from the most recent album, In Our Heads, the band flitted from one instrument to another as if playing musical chairs. Their website features their effortless performance of ‘Are you ready for the floor’ (at the time of writing the visuals are not working well). http://www.hotchip.co.uk/2013/07/test/ The other band that we saw with a Kraftwerk debt are Austra (left). 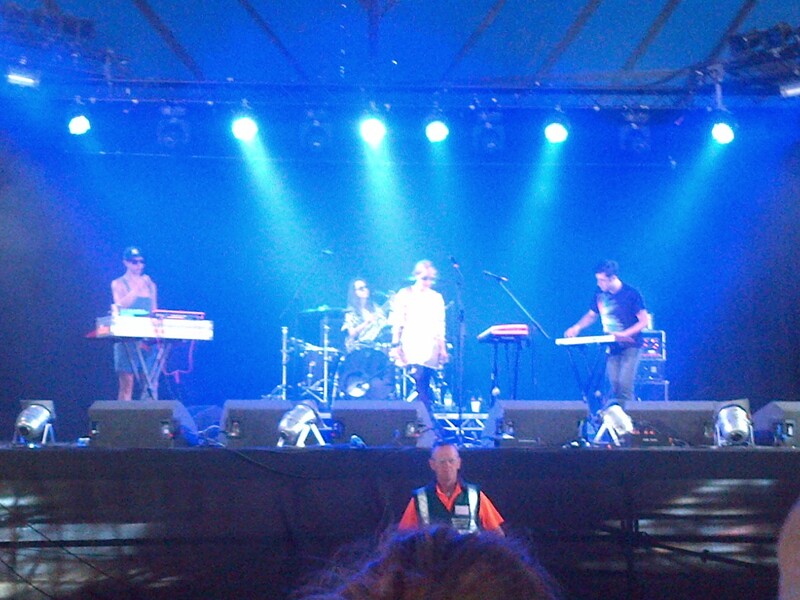 Appearing on the BBC 6 Music Stage, they performed tracks from their new album, Olympia. This album is disappointing relative to their debut, ‘Feel it Break’. But played live, one can jettison the bemusing melancholy of the lyrics that weigh down the album, and enjoy the extraordinariness of lead singer, Kate Selmanis’ voice. Also on the BBC 6 Music stage was the Laura Mvula with her band featuring a cello, violin, double bass, harp, drums and keyboards. Their set was irritatingly short as many are in the middle of the day at festivals. She told us that her husband doesn’t really like her songs, but he approves of ‘She’, so we got to hear that. ‘Sing to the Moon’, the title track from the album renders one mortal and also the upbeat ‘Is there anyone out there’ played, partly on her own admission, because recent gigs had been a bit quiet. A large appreciative audience at Latitude certainly made her feel wanted. Our first musical encounter on Friday afternoon was the enigmatic I am Kloot. I am not sure what to make of them. Their own profile has it that they are “an oddball pop trio based in Manchester, England, that consists of vocalist/guitarist John Bramwell, drummer Andy Hargreaves, and guitarist/bassist Pete Jobson.” The music is rocky, melodious melancholy. A bit grizzled. Songs about too much alcohol; reflection and mortality. Friday was also an opportunity to hear Texas – never a fan – but the rocky show had a feel-good sense to it with lead singer, Sharleen Spiteri, seemingly overwhelmed by the reception. Bizarre shirt, though. 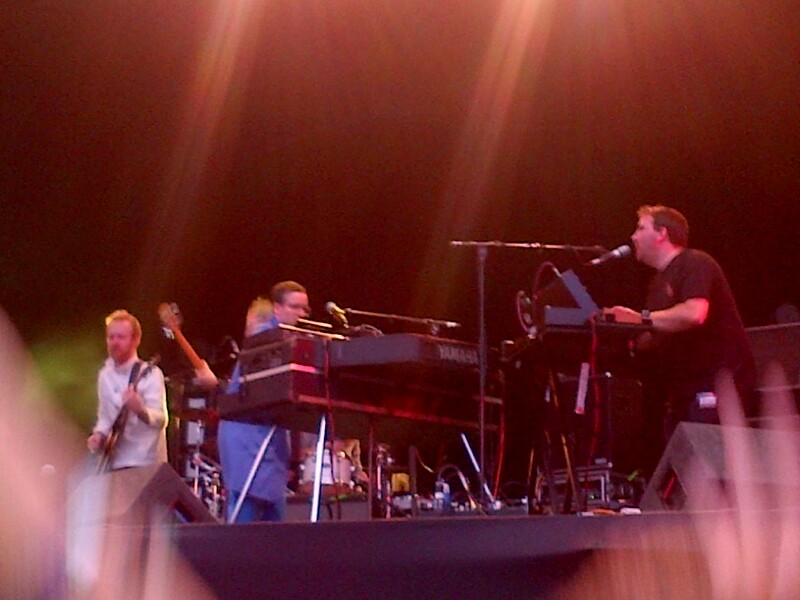 They were the only band allowed an encore. We also saw the Yeah Yeah Yeahs. Karen O’s shrill voice didn’t quite penetrate the guitars. She seemed to get more and more angry as the set went on. And thoroughly unhappy with being ‘managed’ off the stage. Or so it seemed. We dipped into Grizzly Bear, but actually found them a bit uninspiring. We stumbled across The D.O.T. ignominiously in the cinema tent. A duo, Mike Skinner (formally The Streets) and Rob Harvey (formerly The Music), with some great little urban songs. A version of ‘how we all Lie’ that we heard live can be found on Youtube http://www.youtube.com/watch?v=JqrliWEYIko. This picture is scanned from the Südeutsche Zeitung (Monday, 15 July 2013). It is copyrighted RTR, but it one of the most chilling pictures I’ve seen in recent times. 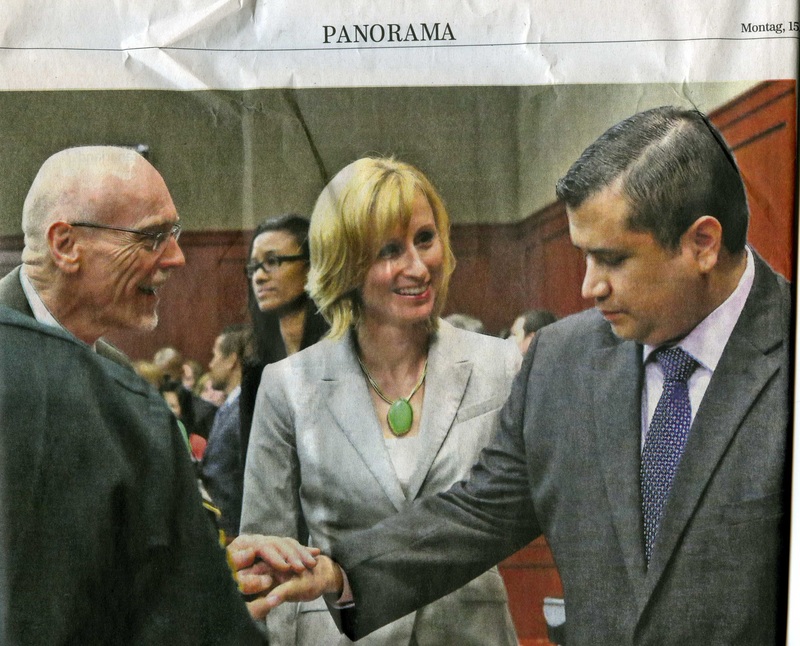 On the right is George Zimmerman, acquitted of murder in a Florida court on Saturday. The smiles demonstrate the ‘success’ of the defence in evading justice. Knowingly. Even if it is a job well done – which it is not – the smiles seem to demonstrate some perverted sense of ‘citizenship’. Zimmerman shot and killed an unarmed 17 year old black man, Trayvon Martin, in what can only been seen as vigilante justice defending a gated ‘community’ against the threat of robbery. ‘Stand your ground’ laws permit lethal force in Florida and other states. Using such force against an unarmed teenager brandishing sweets from a local shop has been demonstrated in a court to be legitimate. It is also seen to be a cause for celebration. Shameful. The short answer surely is, convict racist killers. Guns, compassion, understanding and the other apparent platitudes are red herrings. Every picture tells a story. This one more than most. It is credited to the RAF (Royal Air Force), MoD (Ministry of Defence) and the Press Association. Though it is presented as though it was taken secretly by a photographer keen to alert the world to an important event. In the event, it was stage managed. 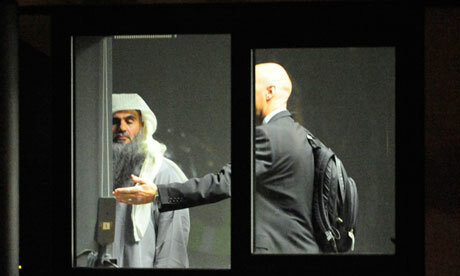 Abu Qatada is now in Jordan having for eleven years fought extradition from the UK where he faces no charges. In Jordan he was wanted in connection with a “terrorist bombing conspiracy”. The British Government has spent a lot of time and money trying to deport him. But attempts to deport him have been consistently adjudged to be in contravention of Article 6 of the European Convention on Human Rights. This Article relates to the prospect of a free and fair trial, something which the European Court and the UK Supreme Court both concur is not possible in Jordan for this case. The solution is threefold. Leave the jurisdiction of the European Court in order to deport people to places where they may be tortured or ‘evidence’ arising from confessions of others under torture is admissible; change the law and agree a Mutual Assistance Treaty with said country; or both. The treatment of Edward Snowden and those who might give him asylum, tells us as much as we need to know about in whose interests states act and where the current balance of power lays. In the name of anti-terrorism, we are all being monitored. They say that they are only collecting “meta data”; i.e. data about who ‘citizens’ contact rather the content of that contact. The usual guff comes from politicians – ‘if you have done nothing wrong, then there is nothing to fear’. And then there is the Latin America situation. The denial of Evo Morales’s plane access to key parts of European airspace on 2 July is extraordinary. Morales, let us not forget, is President of Bolivia and was attending a legitimate energy conference in Moscow. Clearly pressure had been put on European states from the US. But it is interesting that ‘they’ – whoever they are – thought that Snowden was on the plane; he may well have been stupid with respect to whistleblowing and his own safety, but he is not, surely, going to do the obvious (as he demonstrated by not being on the plane to Cuba a couple of weeks earlier)? You know the scenario, battery low and nowhere to recharge. 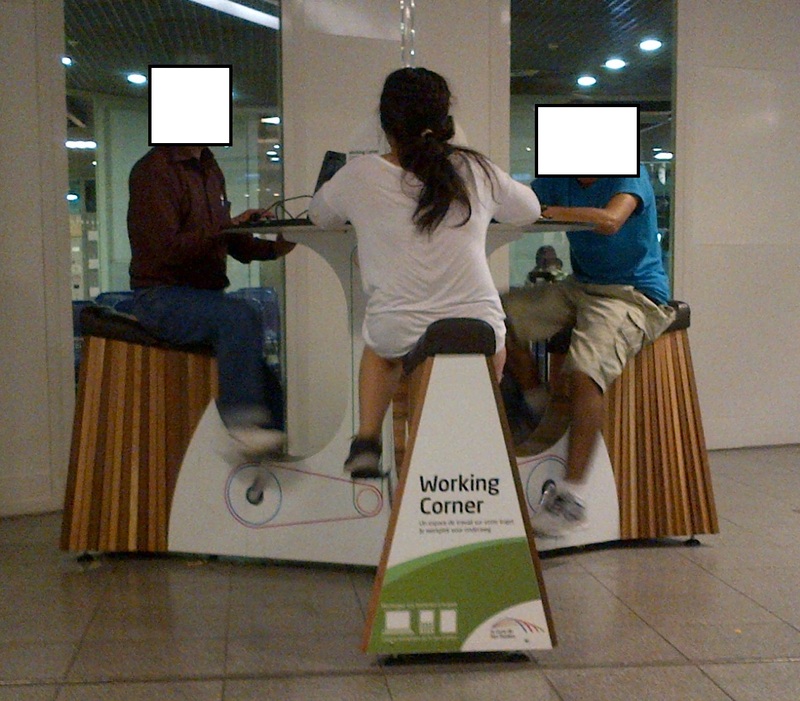 The three people pictured left are charging phones and laptops with their own kinetic energy at the Thalys terminal at Brussels Midi station. Essentially, pedal and you generate electricity that can be transferred to your device. Neat? One wonders. First, this is discriminatory. I was surrounded by a lot of elderly people who, to be fair, would struggle to get on this contraption, let alone pedal. Likewise if one is in a wheelchair. Second, how much energy went into making it relative to what it generates? I cannot help but think that it really would not cost that much to put in a bank of sockets that are attached to solar panels located on the roof for travellers who pay enough to ride the trains.